In prehistoric archaeology, scrapers are unifacial tools thought to have been used for hideworking and woodworking. 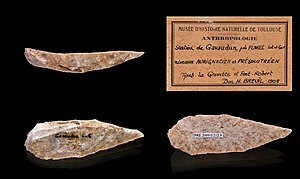 Many lithic analysts maintain that the only true scrapers are defined on the base of use-wear, and usually are those that were worked on the distal ends of blades—i.e., "end scrapers" (French: grattoir). Other scrapers include the so-called "side scrapers" or racloirs, which are made on the longest side of a flake, and notched scrapers, which have a cleft on either side that may have been used to attach them to something else. The edge of the scraper that is extremely angled is the working edge. This edge is often used to soften hides or cleaning the meat off of the hides, in addition to being used for wood work. As the term scraper suggests, this tool was scraped at the hide or wood in order to reach the end goal. They made the scraper to skin animal also. Scrapers tended to be large enough to fit comfortably in the hand and could be used without being mounted on wood or bone. However, it is very likely that scrapers were mounted on short handles even though it is very rare to find mounted scrapers. As scrapers are used they have to be resharpened in order to stay effective. This causes them to get progressively smaller as they are used, resharpened, used, resharpend, and used again. Consequently, the majority of the scrapers that are found on sites are ones that have been resharpened and used to the point of being no longer functional. ^ Bisson, M.S. (2001). "Interview with a Neanderthal: An experimental approach for reconstructing scraper production rules, and their implications for imposed form in Middle Palaeolithic tools". Cambridge Archaeological Journal. 11: 165–184. doi:10.1017/S0959774301000099.